One of the world’s leading drugs science experts has hit out at the UK and said that an independent Scotland could take a more evidence-based approach to drugs policy. 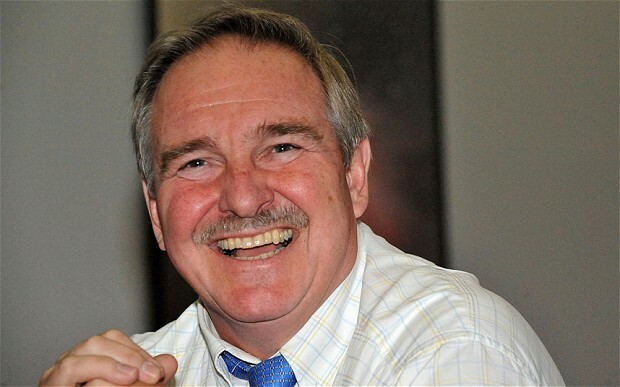 In a recent interview, Professor David Nutt – who was sacked from role as Chair of the government’s Advisory Council on the Misuse of Drugs after high profile disputes with Labour cabinet ministers in 2009 – said that the UK Government is the “only one in the world to have taken backwards steps on drugs control in the last decade” and that under independence, Scotland could adopt more sensible policy and “reverse this regressive trend”. Nutt recently advocated that the Isle of Man could use its statutory independence to pursue a rational approach to drugs policy, and backed Scotland taking this same line, saying benefits would include “reducing crime, improving health and accelerating new medicines research”. A Thousand Flowers has long being trying to provoke a debate about drugs policy in Scotland – an issue that civil society, our media and politicians alike would rather is just swept under the carpet, despite frequent hysteria over dodgy pills and legal highs and appalling rates of alcohol related deaths. A huge global shift has taken place over recent years, with dozens of high profile figures calling for a new approach and an end to the failed war on drugs. Unfortunately, these same figures only seem to feel able to speak out after they’ve retired from whatever leading NGO or Government position they’ve held. Rejecting the orthodoxy that the “scourge” of drugs can be “beaten” through bullets, hardline rhetoric and abstinence education – which has been an unmitigated failure – would still be a brave move for any serving politician, but the global outlook is steadily beginning to improve. At least, it’s beginning to improve just about everywhere except the UK. While the Lib Dems may pledge (yep, another one of those) every couple of years they’re totally going to legalise all the drugs if they win the next election, the trajectory of policy in the UK has been a resolutely backwards one, as Professor Nutt says. This is epitomised by his own sacking, which occurred after he starting offering the Government inconvenient evidence based on peer-reviewed research, rather than the hysterical tabloid hyperbole they prefer when it comes to settling on drugs policy. 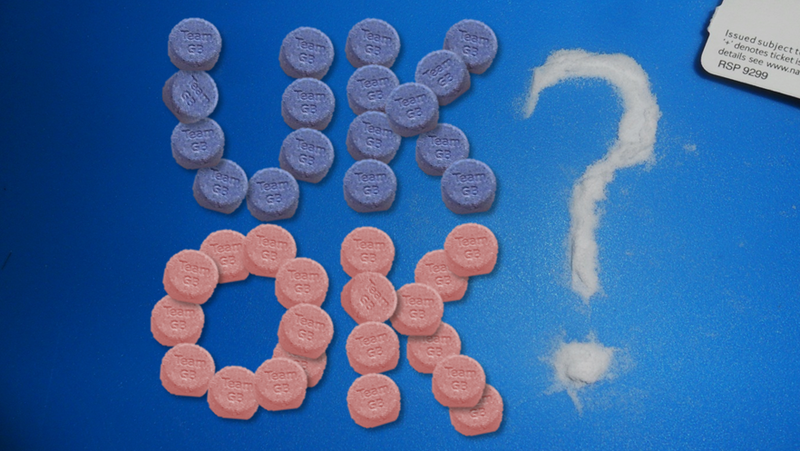 In this article we assess the scope for drugs policy making under independence and examine the prospects of taking a more rational approach to heroin, cannabis and ecstasy. A Thousand Flowers has viewed the full transcript of Professor Nutt’s recent interview and can reveal that he – and the Independent Scientific Committee on Drugs that he established after his sacking from the ACMD – are willing to advise a future Scottish Government on drugs and alcohol policy. “We are happy to advise any government on evidence-based drugs and alcohol policy, so of course we would be pleased [to do so]”, he said. Nutt also responded to claims from arch-prohibitionist and Scotland’s leading rent-a-quote drugs sociologist, Professor Neil McKeganey, that relaxed drugs laws in Scotland would lead to the north of England becoming awash with illegal substances and “rampant drugs trafficking”. He blasted this as “scaremongering”, citing the example of the Netherlands with its “much lower drugs markets.” He continued that “People would come to Scotland rather than the other way round” if our drugs laws were liberalised. Also, welcoming Alex Salmond’s recent admission on a BBC phone-in of being “sympathetic” to medicinal cannabis use, Nutt attacked its banning by United Nations convention as “a lie”, saying that the drug is a medicine and should be “restored to its medicinal status”. Nutt’s comments – which as a highly respected academic and leading expert in this field mark a significant intervention into the independence debate – look set to consolidate the “drugs vote” for the Yes campaign, as the Scottish Mail on Sunday recently reported in typically understated fashion. 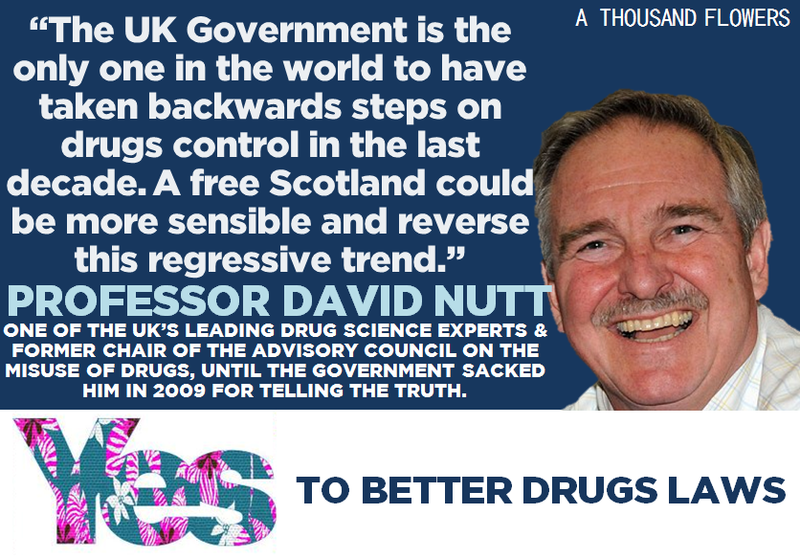 In the event of a Yes vote, A Thousand Flowers will keep pushing for a radical overhaul of Scotland’s drugs laws to place focus on harm reduction and public health, so it’s great to have David Nutt on board with us.